Fantasia Barrino broke down in tears in front of hundreds of fans during her performance at the "Truth Is" concert, staged at the Port of Spain's Ambassador Hotel in Trinidad and Tobago over the weekend, the Guardian reports. Calling the music industry "snakish" and chronicling her own struggles in the public eye as well as the late Whitney Houston's, she said in a part of the performance that seemed as much church service as concert, "The only person who will never leave you is Jesus." The star who was in Trinidad to celebrate her 28th birthday told fans she had been through many obstacles in her life but had emerged stronger with the help of God. "No matter what you've been through, know that you can fly. I have to tell God thank you because he has blessed me. Just when I thought it was all over, he kept blessing me," said Fantasia. "He's always been there. I made it through because of God … Everything I went through is my testimony." Noting that the music industry is "very snakish," Fantasia said it got very tough sometimes, as she had to deal with a lot of negativity during her career. She said, "This year, we lost Whitney Houston … They just wouldn't leave her alone. They did not understand that she was only human. We lose family, friends, all for the love of money. The only person who will never leave you is Jesus." To end her set, Fantasia sang American gospel artiste's VaShawn Mitchell's popular track Nobody Greater. With hands outstretched, the teary-eyed singer led the crowd in a worship session, as fans, young and old, put their hands in the air and sang along. 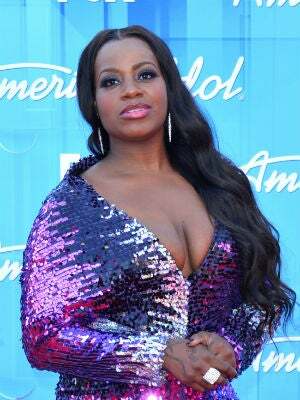 "The only person who will never leave you is Jesus," Fantasia said, as she knelt on stage, before making her exit shortly after 1 am. Correction: An earlier version linked to and quoted from a video of Fantasia performing in Chicago on Feb. 15, 2012.